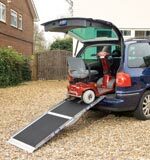 Roll-a-Ramps are the perfect solution for building and vehicle access at home and work. 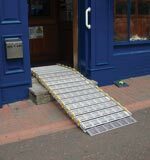 Designed to allow greater freedom to wheelchair and scooter users, their carers and others, the Roll-a-Ramp system provides real independence. Storage and setup couldn't be more simple, view our Rollaramp Demonstration to see how this amazing ramp system works, or alternatively download the Roll-a-Ramp promotional video below. 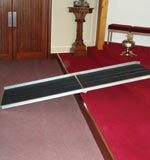 Roll a Ramp is an incredibly strong and lightweight ramp which is very simple to use, store and transport. 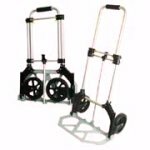 Right-Click and select "Save Target As"
This folding trolley makes light work of transporting your Roll-A-Ramp and comes with a strong ratchet strap. Its easy operation and folding facility for storage makes it a valuable accessory. 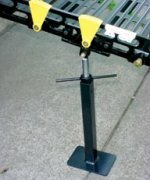 These quick release pins allow the user to couple and un-couple ramp sections quickly and easily. This assists with easy storage and fast coupling to various Roll-a-Ramp fittings and brackets. 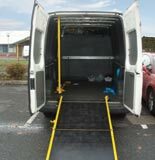 This assembly provides a simple installation of the Roll-a-Ramp into the side door of most full size vans. 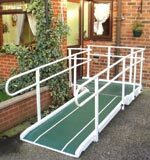 Equally suitable for building access as a semi-permanent ramp access or to be put in place as required. Change Header to Quick Mount Bracket. 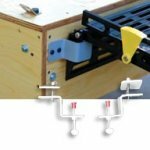 The kit includes the mount plate, special first link and positive lock pins to attach to the full Roll-a-Ramp. The Spacers are used with the 12" twin track style Roll-a-Ramp sets. 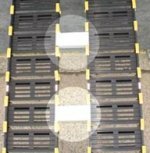 These Spacers provide security by making the ramp width constant with each use as well as ensuring that the width does not change. All spacers easily snap into place on the ramp safety rails. 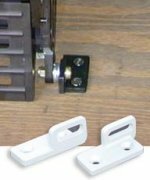 The Seg Mount (S) Bracket is a quick mounting universal bracket that provides a way to temporarily mount to both homes and vehicles using the ramps approach plate. Thumb screws on the bracket hold the ramp in place and provide security. 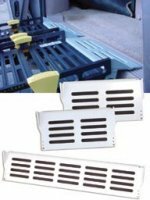 These special approach plates are designed for use on Small Van applications. The Low Van Entry Plate will maximize the entry space on a Mini Van and accommodate the fascia that covers the van’s sliding door mechanism. With this upper approach plate the Roll-a-Ramp will allow many clients to ride into the side door of a mini van. For those who wish to load into the bed of a pickup, this bracket provides an extra degree of security by holding the first load bearing section to the pickup tailgate. Bracket must be secured to the tailgate with either rivets or screws. The low profile does not interfere with other uses. Excellent for attaching beneath the door of a house or to a van floor. For those who need a ramp longer than 12 feet (3.66m), we recommend the use of this support unit. One pair at the mid point will allow a Roll-a-Ramp to be constructed up to 20 feet (6.1m) in length. 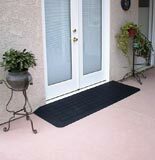 This special upper approach plate is for those users who need entry into either vans or home with an opening that is less than 30" wide and who still desire or need a full 30" ramp to accommodate their chair needs. The special safety fence will guide the wheelchair through the narrowed opening. 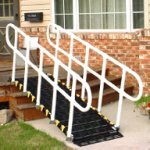 In those situations where a Roll-a-Ramp is installed and Hand rails are desired or recommended, the Roll-a-Ramp handrail set provides security and safety. Constructed of an aluminum reinforced PVC these rails are strong, light weight and maintenance free just as the Roll-a-Ramp itself. The specially designed attachment brackets make the total installation quick and secure, yet the entire system can be easily removed to once again make your Roll-a-Ramp portable.